Why???? And I don't mean T-Pain's outfit. Why does someone with no talent and a record that sold like 10 copies keep showing up EVERYWHERE! I could see if she had a show on ABC that they were trying to promote, but thank God that it not the case! Please, the powers that be find someone with talent to put on television! Could they have possibly found someone a little closer to David Archuleta's height? I don't know if he is old enough to have hit his growth spurt yet, but they barely fit in the same frame! Why did they pair cute, wholesome looking Colbie Caillat with Richie Sambora? Hey, I will admit I was a huge Bon Jovi fan circa 1988, but Richie is rough! Not rough around the edges, but rough through and through! Put Colbie next to someone nice and sweet, like maybe that cutie from Lifehouse! She has so far not turned into to a crazy starlet, aka Lindsey, Paris, etc., etc. We need to keep her that way! Let me first add a positive before a negative, just to keep my karma in check! 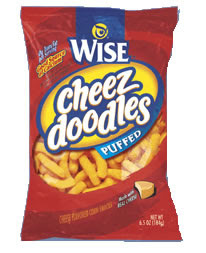 I LOVE Motley Crue. I have always, well at least since I was 12, and will continue to do so. Nikki Sixx is my absolute favorite rock dude and Tommy Lee is one of the coolest guys ever. 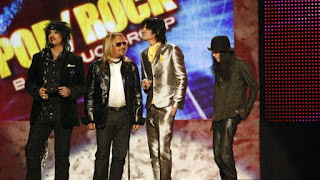 Vince Neil, eh, whatever and Mick gets my Keith Richards award for having the ability to take a licking and keep on ticking. However, my guys of the Crue, let me ask just two questions to the two of you that I really care the most about. Tommy, dear, did you go out swimming and get bit by a shark? Perhaps, you did and didn't have time to run home and change and just decided that if you wore said shark to the AMA's Kid Rock would see how bad you were and leave you alone for good! Nikki, the beautiful one, I am down with your rocker look. I was with you when you wore makeup, more makeup than I even own,(which is a LOT). Why, though, Nikki do you look like you are trying to steal Keith Richards part on Pirates of the Caribbean? I love you Nikki, but my love for Keith is very well documented so don't think that just because you are cute you can steal that movie away from Keith and I am not going to have something to say about it. Why do these two girls have record deals? While Taylor Swift seems like a perfectly wholesome girl, (sorry Miley, no nice words for you, you annoy me), she can not sing. The lack of singing also goes for Billy Ray's spawn. Thank God for Alicia Keys, Leona Lewis and Mariah or my ears would have been bleeding. Did Mariah get a new stylist? Or did her new hubby tire of her showing her everything to everyone? Well, whatever it is that has brought about this change I salute you Mariah. You looked really nice. You also proved me wrong, because I really thought that at any moment you were going to rip off the pretty dress to reveal something too short and too tight. Now I have this question-was Mariah's old stylist, the one she obviously fired as she looked great last night, hired to hooch up Beyonce? Beyonce, there is never a good reason to run out of your room without your pants on. That is why people have a common nightmare about that very situation. The only thing that I could possibly fathom is that maybe you just got a contract with Hanes. Even if that is true I think there are more appropriate places that you could model their underwear for them. You are from Houston. I know for a fact that there are MANY, MANY stores that sell jeans, dress slacks and skirts there. There is a whole plethora of outfit choices out there. You have NO excuse for going out in your knickers, absolutely none, nada, zip! Why does anyone think that any of us care about these people? Sorry Nick, you seem like a great guy, but you always pick THE worst girls, so I am over seeing you as well! Are they going to be able to get back upright without help? As hard as they try to make us believe, they are not new or kids. Did her son get a hold of scissors and do something really drastic to her hair? 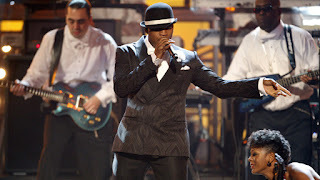 I really think Ne-Yo has a very good voice. Once he was on Cribs and he had a very nice house. I thought it was very tastefully decorated beyond his years, (hey, I'm into design so I had to throw that in). I also once read that he bought his mom a house, which I think is a great thing. However, did I need to be subjected to Ne-Yo doing Chris Brown, doing Usher, doing Michael Jackson. Please, you guys, try to be more original. You are in a CREATIVE field, use that creativity in your performances. 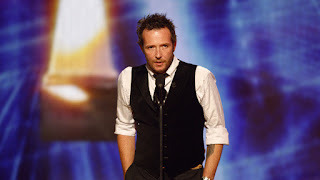 When I saw Scott Weiland from a distance, I thought, "Oh, he is looking much better. Maybe he has finally cleaned up his act". Then he started talking. Enough said. Well, they always say that if you are going into a career as a singer that you should have something to fall back on. I guess they are just preparing themselves for that. I would like to go out on a positive note. 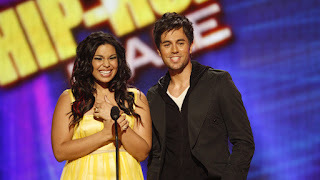 I thought Jordan Sparks looked really cute. The yellow dress fit her personality perfectly and was a great, unexpected color in the fall. She looked really cute and had a great smile. Enrique Iglesias wasn't half bad either. He may have quite possibly just woken up from a deep slumber, but he still looks cute either way! 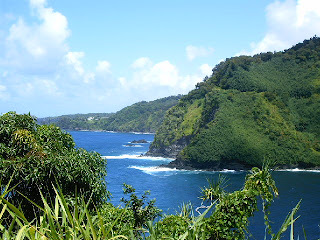 Ok, so I am not going to some tropical paradise, but I am off from work and school all week! Yeah! Time to start the Christmas shopping, put up the tree and talk Gabriel into climbing up on the roof to put the lights on the house. I faced my #1 fear and made it through, without fainting or getting sick to my stomach,(which makes it better for me and my classmates :) ) I have read in surveys that people are more afraid of public speaking than death. While I have never participated in one of those surveys I would have to agree. I had to take a speech class and I put that sucker off until it was one of the last classes I need to graduate. I have always been terrified of public speaking. I LOVE to talk, which is unfortunate for my family and coworkers, but when it comes to everyone staring at you listening to every single word and not saying anything back, it makes my heart race. I can feel my face turning tomato red and then I get even more embarrassed. It is just not a pretty sight! I once even forgot in a presentation the word dresser. I am an interior design major! Sad,(I say as I am shaking my head at my own stupidity)! I am happy to report though that I have come out triumphant! I am done with my speeches and made an A on all of them. Mission Accomplished! Now I have to face my next fear and ride a roller coaster! :) One step at a time! I won an award! It was so unexpected that I don't even have a speech ready, yet....but here goes. I would like to thank the academy, ok well, maybe not the academy, but I would like to thank Dorkys over at Dry as Toast, http://dryastoast.blogspot.com/ for this honor! *Each Superior Scribbler must in turn pass the award on to 5 most deserving Bloggy friends. 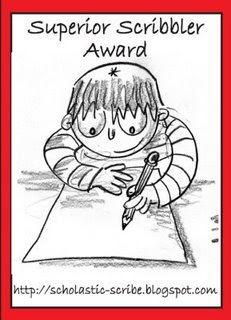 *Each Superior Scribbler must link to the author and the name of the blog from whom he/she has received the award. *Each Superior Scribbler must display the award on his/her blog, and link to this post, http://scholastic-scribe.blogspot.com/2008/10/200-this-blings-for-you.html, which explains the award. Today was an annoying day! You know those kind of days when there is no big catastrophe that happened, but instead about ten little things that keep knocking your spirits down every time they start to lift right up! At one point I told my friend that I was going to turn my frown upside down, but shortly after I was content with letting that sucker stay down for the rest of the day! 2. MAC. A new eyeshadow, lipstick or anything to makes me all sparkly will always lift my spirits and if it doesn't lift anything at least it can give the illusion that it is! 4. US Weekly. I know that I shouldn't care where celebrities shop, where they eat or what clothes they wear, but I do! I love seeing all of the pretty hairstyles, beautiful dresses and I will admit that sometimes if I am having a bad day and I see in a magazine that someone else is out doing something crazy I feel a little less insane myself. 5. Watching Animal Planet with Barkley. Seeing the pup trying to get the other animals out of the television never grows old. It is especially funny when we watch horse racing. As the horses are rounding the corners on the track and go off of the screen, Barkley runs around to the back of the tv thinking he will catch them back there! 6. Watching the travel channel. It always makes me feel better to see cool vacation spots and imagine being in one of them. So we had a great night celebrating Halloween. Our neighborhood has tons of trick or treaters so we always get to meet new people and see all the cuties in their little costumes. Many of the adults even dress up, so we decided to get into the spirit. My friend's son came over and we went door to door with him as well. I was even offered candy since I was dressed for the occasion, but my days of trick or treating are long gone, as I am old and my thighs do not need any more candy! My mom after dressing up with all of her coworkers as dalmations. Thank you Lord, she can stop barking at me now! And Gabe, whose costume probably wouldn't have went over very well if he would have went into the bank in this get up! Although, he would have been famous...on the 10 o'clock news!